Great value stays in over 750 hotels across the UK. Meal Deal includes a full Premier Inn Breakfast, any 2-course dinner plus a selected drink at selected Restaurants plus Kid's enjoy a Free Breakfast too! Where do I use my Premier Inn voucher code? Browse the Premier Inn deals on NetVoucherCodes, click it and follow the link to the Premier Inn website. Enter a location into the search box, choose your arrival date, number of nights you would like to stay, number of rooms needed and who’s staying. Click ‘Search’ to view the hotels in your chosen location. The following screen will show all deals available, when you’ve found a room that suits you, click ‘Book now’. Review your selection & then click ‘Continue’. Your savings will have been automatically applied, just input your payment details and select 'Complete booking' to complete your transaction. "Check out the Special Offers section to find amazing deals on City trips, short breaks and last minute bookings." There’s no replacement for a good night’s sleep. If you’re staying away from home, you want to know you’ll be resting well in clean and comfortable accommodation, and knowing you’re paying a fair price will help you sleep all the sounder. Premier Inn’s growing chain of budget hotels offers pleasant rooms and short breaks to travellers across the nation, and they’re so confident you’ll sleep well they’ve put it under their Good Night Guarantee. Every Premier Inn room features a comfortable bed (King-size where available) with cosy duvets and pillows, a high-powered shower, 30 minutes of free WiFi access per day, blackout curtains, Freeview TV (again, where available), and tea and coffee making facilities. Every Premier Inn also has an on-site restaurant, and usually a bar, too. Premier Inn like to advertise that their room prices start at £29 - and we’d like to help cut that down for you even further. Whenever there’s Premier Inn discount codes or vouchers to be had, seasonal offers, or special promotions, we’ll list them here on our deals page. Find Premier Inn hotels in the capital city where bright lights shine, the bold streets intrigue and the big red buses wonder. Engross yourself in the city of London’s infectious energy and fast pace of living while surrounded by some of the most incredible attractions in Europe. Find Premier Inn’s near specific places in London whether it’s near museums, attractions, shopping destinations or transport links, you can position yourself in a place that makes it easy for you to carry out your day to day life while in London. Find hotels in locations near Covent Garden, The Harry Potter Studios, The Houses Of Parliament, Kings Cross and Oxford Street and make your stay in London convenient and easy. 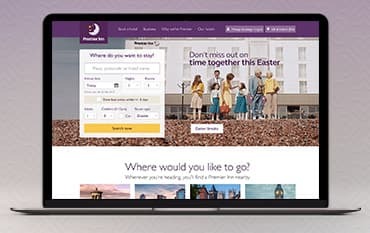 Book a hotel at Premier Inn, the award winning hotel chain, with more locations than anyone else, where kids stay and eat free, where you can enjoy free wifi and where a good night's sleep is guaranteed. Book a hotel in a Premier Inn airport hotel and take the stress out of travel. Premier Inn's are situated close to all the major UK airports allowing you to roll straight out of bed into the departure lounge. And, being the biggest hotel operator at airports across the UK has its perks. Premier Inn has teamed up with the top parking providers at Heathrow, Gatwick, Stansted and Manchester airports offering some of the best value hotel and parking packages. You will find over 700 Premier Inn hotels in great destinations across the UK including London, Essex, Devon, Cumbria, Cornwall, Bristol and Isle of Wight. You’ll also find Premier Inn hotels in Scotland, Wales, the Republic of Ireland, Northern Ireland and Germany. One location you’ll love is Manchester, the cutting edge, creative, city where you can find ample of Premier Inn hotels. Or, venture to Edinburgh, where annual festivals and celebrations are never in short supply as well as a dram of whisky that you can enjoy anywhere from Edinburgh Fringe to Hogmanay. Book a hotel for a weekend break, whether it be for shopping, sight seeing, the seaside, history or hiking and find a Premier Inn hotel in each location perfect for your needs. Let the good times begin! I haven't received a confirmation Email regarding my booking? It is advised that you check your spam filter in your emails as sometimes thing can get mixed up. If you can't find it, you may have experienced a technical issue. You will need to call the Premier Inn team on 0333 003 8101 for more assistance. Can I Make a Cancellation? If you wish to make a cancellation, you will need to go to the 'Manage Bookings' section located in the top right-hand corner. You will need your booking reference and the bookers' surname or at least one of the guests' surnames. From here you can make a cancellation. You will then receive an email confirming this. However, if you have a booked a Saver Rate, you will not be refunded for your cancellation. For more answers to FAQ's, see here. Find all Premier Inn Hotels across the UK on the Hotel Directory page. Find more Contact Details here. Premier Inn is one of the biggest hotel chains in the UK with super comfortable rooms at very competitive rates. Grab a Premier Inn Voucher Codes for the best discounts and hottest special offers. At a Premier Inn Hotel you are sure of a warm welcome, excellent food & drink all at reasonable prices. Rooms are spacious have en suite bathrooms, a comfy bed and a TV. With brilliant breakfasts - sizzling bacon, bubble and squeak, plump sausages and eggs cooked to perfection, there’s even a continental selection of pastries, American pancakes, fruits and smoothies. Premier Inn is a family friendly company, kids are welcome so wherever you’re heading, you’ll be sure to find a Premier Inn nearby. We are constantly on the hunt for Voucher Codes for Premier Inn to help you with your money saving. Our experts check dozens of sites for secret codes including NHS discounts, student sites & social media channels saving you time & money!